The legend begins in the Eastern Continent, in a land known as Superior Body. There, on top of Flower-Fruit Mountain, rested a magical rock. Since the time of creation, the rock had collected the essence of heaven, earth, and the stars. As eons came and went, the miraculous rock, ever so slowly, grew a stone egg bearing a supernormal spirit. Suddenly, the rock bursts open, giving birth to … a monkey! At first, the monkey lives among the regular apes on Flower-Fruit Mountain, until one day he displays his courage and wisdom by jumping through a waterfall and discovering, behind it, a special cave. The other apes follow him into the cave and live there, crowning him their Monkey King. He spends his days in frolic and feast, but not for long. Soon he discovers mortality and realizes that, despite his life of luxury, one day he, too, will die. He becomes despondent and decides to give up everything to seek immortality. He leaves the mountain and, disguising himself in human clothes, finds a Taoist Master. Monkey quickly becomes the Taoist’s favorite disciple. He learns magical powers like the 72 Transformations, which allow him to become anything he wants, and the ability to fly 60 thousand miles in one somersault. The Taoist names Monkey Sun Wukong, meaning—Awakened to Emptiness. After leaving his master, Monkey, who was always rather mischievous, makes himself unpopular amongst the deities. He disrupts the Dragon Palace of the Eastern Sea, demanding an armor and special weapon (which later became his signature magic cudgel). He even goes down to the underworld and terrorizes the King of Hell. Exasperated, the deities fly up to heaven to register a formal complaint with the Great Jade Emperor. Hoping to keep him from causing more mayhem, the Jade Emperor bestows upon Monkey the highfalutin title of Protector of the Horses in the Imperial Stables. Monkey is initially pacified. But when he discovers he’s nothing more than a horse groom, he revolts. Heavenly warriors are dispatched, yet prove no match for Monkey’s abilities. The Jade Emperor then again chooses appeasement and gives Monkey a new celestial post: Guardian of the Immortal Peach Orchard. But Sun Wukong, now calling himself “The Great Sage Equal to Heaven,” is as arrogant and unruly as ever. One day, as the story plays out, the deities decide to throw a banquet for the Empress Queen Mother. All the gods are invited. The “Great Sage Equal to Heaven” is not on the guest list. Monkey gets very, very angry. He sneaks into the palace, steals the peaches of eternal life, the imperial wine, and the elixir pills of immortality. He then throws a tantrum, sabotages the festivities, and destroys the orchard. He has to be stopped. This time, the Jade Emperor sends 100,000 heavenly warriors to arrest Monkey—to no avail. Only the combined powers of the three-eyed deity Er Lang Shen and the great Taoist Lord Lao-Tzu (Laozi) capture him at last. But the Monkey had already feasted on the peaches of eternal life and downed the elixir pills of immortality, and so neither fire nor axes nor lightning seem to affect him. Lord Lao-Tzu then casts Monkey into his Eight Trigram Furnace. The result? After 49 days in the searing flames of the most powerful crucible of Taoist alchemy, Monkey emerges sizzling, yet otherwise unscathed. In fact, the heat only serves to give him fiery eyes with supernatural penetrating vision. Finally, the Buddha challenges Sun Wukong to a dare—Monkey needs to get on the Buddha’s hand and then jump off it. Piece of cake for a Monkey who can travel tens of thousands of miles in one somersault, right? But the Monkey had met his match and could not overcome the Buddha’s divine powers. When Monkey flew to what he thought was the edge of the universe, he found five pillars and then urinated on them, just to mark the spot as evidence. Then he flew back, ready to gloat. It turns out, though, that the Buddha had transformed his hand, and the pillars were actually his fingers. Monkey, in fact, had never left the Buddha’s palm. Buddha then trapped Monkey under a mountain, where he remained captive for 500 years. By then it was China’s Tang Dynasty, and the time came for a Buddhist monk to go on a dangerous journey in search of sacred scriptures. He would need protection as he travels from the ancient Tang capital of Chang’an to what is now known as India. And so the Buddha arranged for the Tang monk to pass by the mountain where Monkey King was trapped, and for Bodhisattva Guanyin to come down and release the fellow. Monkey was now willing to obey and remain faithful to his new master monk and his mission. But his mischievous nature had not changed, and so the Bodhisattva gives the monk a magical golden headband to place around Monkey’s head when he needs to control his disciple. Through 81 trials and tribulations, Monkey King protects the monk and his fellow pilgrims on their journey. Flying left and right and using his peculiar magical powers, he conquers demons, battles monsters, sees through delusion, and rescues the monk from being eaten, becoming perhaps the most colorful creature in Chinese literature. 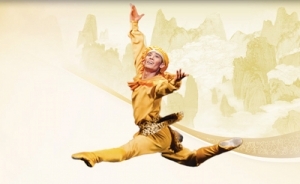 Shen Yun’s 2012 How the Monkey King Came to Be, choreographed by Yungchia Chen with music by Jing Xuan, is an abridged version of this classic.